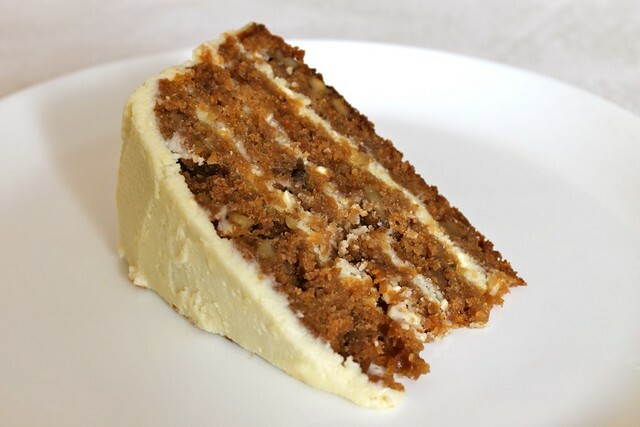 I happen to love carrot cake. From American style cakes this one is my favorite. For a long time I kept trying it in Moscow bakeries and I have to say I do like it almost everywhere. I figured out what an ideal carrot cake for me would taste like though. I love when the cake itself is very moist. It easily crumbles and I can recognize coarsely chopped crunchy walnuts. The cream cheese frosting tastes strongly of cheese and is even a little salty. And now, thanks to my beautiful friend Aidina I can make it at home. 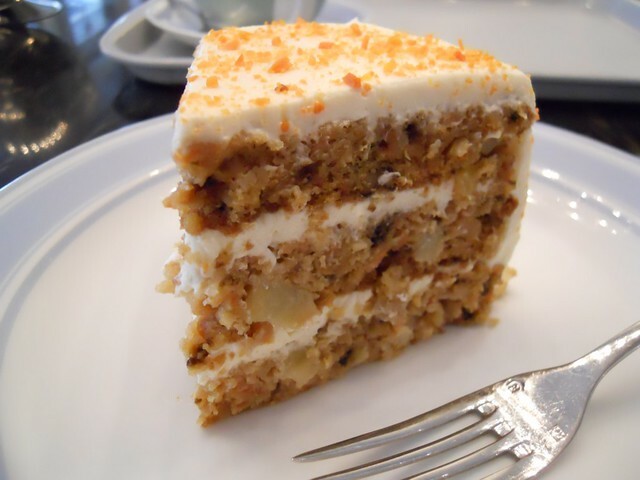 If we come back to bakeries for a moment, my favorite carrot cake in Moscow is at Upside Down Cake bakery. It is an absolutely beautiful Suki Maman's variation with pineapple bits in the cake and pineapple liqueur in the frosting. When I make it myself though I prefer to keep it classic. I made it several times and not that it didn't work but it was always not exactly what I wanted. 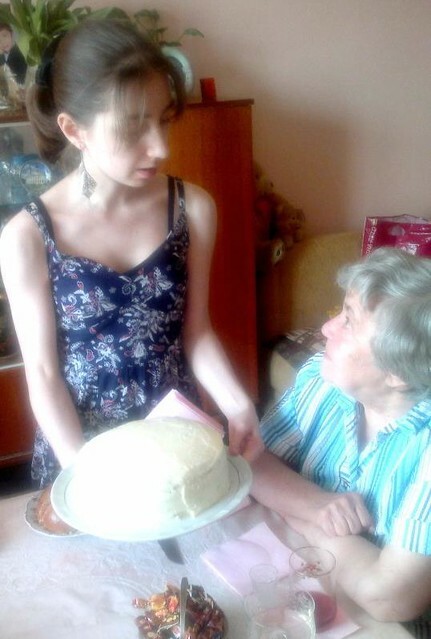 This spring I got to know Aidina Muratalieva, who is a passionate baker now starting several creative projects in Moscow. I came to her baking class devoted to carrot cake especially and it turned out that she loves it almost exactly the same way as I do. She kept baking it time after time she did all the tweaking needed to make it taste right. My granny just had her 81st birthday and it felt like the right occasion. Following Aidina's recipe I made a carrot birthday cake. Granny was never big on sweets, but she loved the cake. So did my parents and my bro. So did I. From Aidina's permission, I'm posting her recipe with minor tweaks to my taste. The recipe looks long, but it isn't too complicated. It is just a layer cake: you bake the cake, make the frosting and then assemble. I'll add just a couple of remarks regarding the process. You will need to divide the cake batter into two equal parts (layers) and bake them in separate baking dishes. This is important for two reasons. First, this way the cake layers bake through faster and do not dry out and get crispy on the outside. Second, this way they do not rise too much in the middle compared to the edges and come out almost ideally flat (this is much better for further assembly). You can place the two baking dishes in the oven simultaneously, but make sure to check both for readiness before taking out (one or the other might need more baking time). If you have just one baking dish, it makes sense to bake one half of batter and leave the other half in the fridge. Then clean the baking dish and bake the other half. When you make the frosting, you really need to have the cream cheese and butter at room temperature. If the cream cheese is cold (out of the fridge) the frosting will not come out smooth (cheese granules will remain). It is safer to mix the frosting with a spatula by hand. If you use electric mixer or whisk it may split. To bake you will need two round baking dishes (preferably springforms), 21-23 cm in diameter each. Slightly oil each springform and line the bottom with baking paper. Place the nuts in a heat proof bowl and roast them in a 160C oven for 10 minutes, stirring 2 or 3 times. Take out of the oven, add 20 g of butter and 1/4 tea spoon of salt and mix. The butter should melt and nuts should get covered in it. Let cool a bit and chop coarsely. In a large bowl combine the dry ingredients (flour, spices, orange zest, baking powder and coco powder). Mix well to make sure everything is spread equally. In a separate bowl combine the eggs with sugar and whisk till combined. Add vegetable oil and orange juice and whisk again. Add one half of liquid ingredients to the dry ingredients and mix with a spatula till the dry ingredients get wet and there are no big lumps. Do not overmix the batter, otherwise the cake might turn out too dense. Add the rest of liquid ingredients, grated carrots and nuts and slightly mix again. Divide the batter equally between baking dishes. Bake at 160C for around 50 minutes - 1 hour. Check the readiness: a toothpick inserted into the middle of each cake should come out clean. Take the cakes out of the oven, let stand for 3 minutes, then revert from the baking dishes onto a rack. Let cool completely (at least for 2 hours). If you are not assembling the cake right away, cover them with film and refrigerate. With a long and sharp knife cut each cake horizontally into two (to get four layers in total). Combine the butter, cream cheese, icing sugar and salt in a medium bowl and mix with a spatula till everything is fully combined. Place the first cake layer on a flat serving dish. Spread 20% of the frosting on top of it and cover with the second cake layer. Repeat till your fourth cake layer is on top. Cover the top and the sides with the remaining frosting. Decorate with marzipan carrots or with chopped walnuts (if using). Refrigerate for at least 4 hours or better overnight before serving. Serve and have well deserved fun.